Scientists Disclose Plans To Make Superflu In Labs : Shots - Health News The proposed studies would essentially create a recipe for a more contagious bird flu. Some scientists worry these viruses could escape the lab and possibly kill millions. But others think the information gleaned from the experiments is critical for keeping H7N9 from becoming a global threat. Some scientists think new types of bird flus should arise only in chickens, not in labs. Here a worker collects poultry on a farm in Kathmandu, Nepal, where the H5N1 virus was infecting animals in October 2011.
Who do these guys think they are, the Dr. Frankensteins of virology? First, two teams of virologists created more dangerous versions of the deadly H5N1 flu. Now they want to give the H7N9 virus, which has already sickened at least 134 people and killed 43 people in Asia, a few new capabilities: drug resistance, faster transmission between people and the ability to sneak past the immune system. Flu researchers Ron Fouchier, of the Erasmus Medical Center in the Netherlands, and Yoshihiro Kawaoka, of the University of Wisconsin-Madison, wrote up a whole list of risky experiments they're starting with the new H7N9 bird flu and then published their plans Wednesday in both Science and Nature. About 20 other scientists also signed the letters. The proposed studies would essentially create a recipe for a superflu. Some scientists worry that these strains could escape the lab and possibly kill millions — or get in the hands of the wrong people. The H7N9 bird flu first appeared in China about six months ago. The virus doesn't spread very easily between people, and most people have probably caught it from live poultry. But Fouchier and others are concerned that H7N9 could evolve into a bigger problem. "We know that all pandemic viruses over the last century were transmitted via the airborne route," Fouchier tells Shots. "The H7N9 virus is not yet transmitted efficiently [through the air]. But the question is, can it gain the capacity and therefore pose a serious pandemic threat?" To figure that out, Fouchier and Kawaoka are planning to genetically engineer H7N9 and then see which changes in the virus's genes accelerate its spread between mammals. "By engineering these viruses, we can stay ahead of the game," Fouchier says. "By knowing which mutations might arise in nature, we can be on the lookout for them. That's clearly of great relevance for public health." Other flu researchers don't agree. They think the risks posed by these lab-made viruses outweigh their benefits. Others question whether the proposed experiments have the proper oversight and argue that similar studies haven't offered useful information for stopping flus. "The scientific justification presented for doing this work is very flimsy," infectious disease specialist Adel A. F. Mahmoud, of Princeton University, told Science. "And the claims that it will lead to anything useful are lightweight." Fouchier and Kawaoka triggered a storm of controversy in late 2011, when they engineered versions of the H5N1 that could spread through the coughs and sneezes of ferrets — the lab stand-ins for people. In nature, H5N1 doesn't pass easily between people. But both Fouchier and Kawaoka figured out that just a few changes in the virus's genes could make H5N1 more contagious — and a bigger threat. 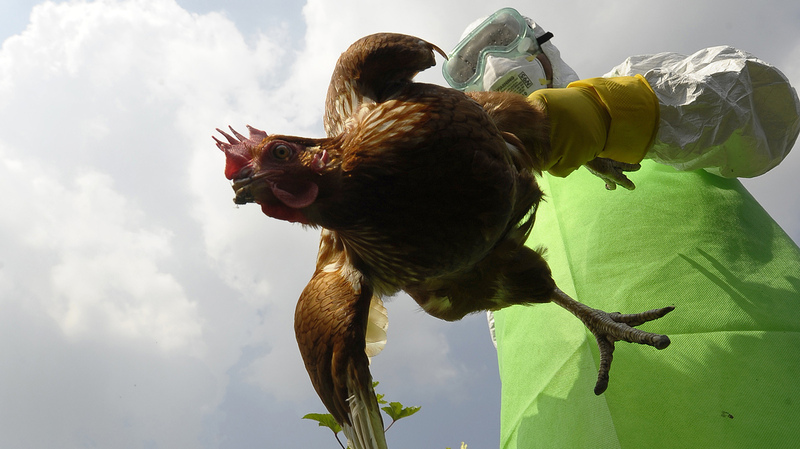 Those findings prompted the Department of Health and Human Services to set up new rules for risky studies with H5N1. It established a special review process for funding the work and outlined seven criteria that proposed experiments would have to meet. HHS and the Centers for Disease Control and Prevention said Wednesday that the experiments proposed by Fouchier and Kawaoka will also undergo a similar review process before the researchers receive U.S. funding. Fouchier says that he has already started some of the H7N9 studies with money from the European Union and the Dutch government.